Experimental manipulations of organism abundances can provide clear tests of ecological theory. While it is often easy to manipulate plant abundances, tests of multi-trophic theory require manipulation of animals as well - and animals, being mobile, can behaviourally respond to manipulations. For example, increasing the density of a species can simply result in individuals leaving the study area when resources grow scarce. Fencing the study area can result in unnatural behaviour that confounds the experimental manipulation. One solution is to conduct experiments in small, naturally contained ecosystems, where animals typically do not disperse except at certain life stages (e.g. following pupation) or infrequently (e.g. by phoresy). Huffaker popularized this approach in the 1950s with mite communities on oranges, and since then major contributions to ecology have been made with experiments in systems as diverse as rockpools, pitcher plants, and mangrove islands (Srivastava et al. 2004). Bromeliads are herbaceous plants found only in the New World tropics (Central and South America, SE USA, Caribbean islands), although the most famous member of Bromeliaceae - the pineapple - has been cultivated and grown around the world. All bromeliads have the same basic structure of a spiralling rosette of elongate leaves. We study a subset of bromeliads whose leaf bases are tightly pressed together, creating a series of watertight compartments. 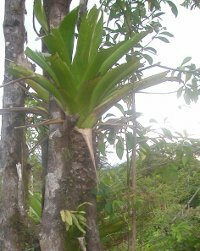 Most of these bromeliads are epiphytic, and their roots are mainly used to attach the plant to the tree rather than uptake nutrients. Epiphytic bromeliads obtain most of their nitrogen from either dead leaves from the surrounding forest that fall into the bromeliad and decompose, or -when spiders build their webs across bromeliad leaves - from guanine-rich spider feces. Bromeliad leaves contain tiny specialized trichomes that aid in the uptake of nutrients dissolved in the tank water. Water-filled bromeliads are colonized by a range of aquatic organisms. 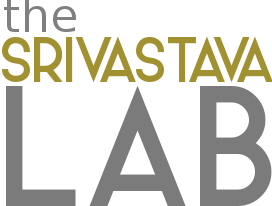 The detritus is broken down by bacteria, fungi and a variety of detritivorous insect larvae (especially fly larvae, but also scirtid beetle larvae and caddisfly larvae), tiny ostracods and oligochaete worms. The bacteria, fungi and fine organic particles fuel populations of other microfauna, such as ciliates, flagellates and rotifers, which in turn are consumed by filter feeding organisms such as mosquito larvae. 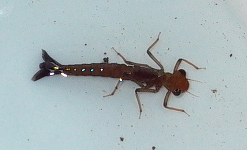 All the macroinvertebrates are vulnerable to predation by a range of insects, including tanypodine chironomids, corythrellids, tabanid larvae and -largest of all- damselfly larvae. Remarkably, many of the animals recorded for bromeliads are found in no other habitat, suggesting that bromeliad fauna is either physiologically or behaviourally constrained to this habitat. An important feature of bromeliad food webs is that the insect species almost all occur as larvae, then pupate into winged terrestrial adults which leave the bromeliad to reproduce. Other invertebrates like oligochaete worms and ostracods spend their entire lifecycle in bromeliads, but can disperse occasionally between bromeliads by attaching to amphibian bellies, as shown by Luiz Lopez. In some regions, bromeliads may also contain larger species, like tadpoles of poison dart frogs or crabs. The food web can be manipulated in several ways. First, bromeliad communities can be assembled from scratch in plastic analogues of bromeliads custom-built to mimic the structural complexity of the habitat. Second, bromeliads can be emptied completely and then restocked with exactly the desired invertebrate food web. As washing cannot completely remove all insects from a bromeliad, this method requires netting the bromeliad for six months until all resident insects have emerged and none have colonized. Third, small tubular enclosures can be inserted into the leaves of larger bromeliads and stocked with a leaf-scale food web. Mesh-covered holes in the enclosure allow water to pass in and out of the enclosure and prevent stagnation (bromeliad leaves oxygenate the water). Such manipulations have demonstrated complex and often unexpected interactions between many components of the food web. For example, by breaking down detritus detritivores can facilitate nutrient uptake by the bromeliad plant - but only when predacious damselfly larvae are also present. When damselflies prey on detritivore larvae, they prevent detritivores from pupating and flying away with all the nutrients in their bodies (Ngai and Srivastava 2006). In this case, predictions from traditional trophic cascade theory are reversed by this link (pupation) between aquatic and terrestrial ecosystems. Oviposition by insects into bromeliad water represents another terrestrial-aquatic link, and our experiments have shown that terrestrial spiders can reduce abundances of detritivorous insect larvae - and release ostracods and oligochaetes from competition (Romero and Srivastava 2010). Not all species interactions are antagonistic: for example, some detritivores facilitate other detritivores. Tipulid and scritid larvae shred and scrape, respectively, detritus into fine particles that fit into the mentum of detritivorous chironomid, and so increase chironomid pupation rates (Starzomski et al. 2010). This detrital "processing chain" may explain why communities with high detritivore richness have more ciliate species - increased production of fine detritus may promote bacterial growth and therefore ciliates (Srivastava and Bell 2009). Bromeliads are also useful in providing replicate habitat units for surveys of insect diversity. At the Costa Rican study site bromeliad insect communities are primarily driven by environmental conditions such as bromeliad size and forest cover, rather than spatial location (Ngai et al. 2008) - probably reflecting the strong dispersal abilities of many bromeliad insects as adults. For example, males of the top predator, the damselfly Mecistogaster modesta, are highly territorial and defend the largest bromeliads in open forest, with hopes of mating with females who preferentially oviposit in large bromeliads (Srivastava and Melnychuk 2005). This behaviour restricts damselfly larvae to bromeliads large enough to contain 100 ml of water, with strong top-down effects on the biomass of detritivores, breakdown of detritus and release of nutrients. Damselfly oviposition also partially explains why predator diversity increases faster with bromeliad size than that of their prey - the remainder of the pattern can be explained by the lower regional abundance of predators combined with sampling effects (Srivastava et al. 2008). Mosquito larvae also are strongly affected by bromeliad size, with species of similar vertical niche within bromeliads specializing on different sized bromeliads - possibly to avoid competition (Gilbert et al. 2008).